In 2008, Masae Ekiguchi (a convenience store clerk and aspiring drummer) was searching far and wide for a singer and guitarist for her new dream band. One night at work she met Yuma Natsume, and up and coming model and actress, who was eager to leave her talent agency and expand into music. After many months of practice, in 2009 they started performing as a duo called 99% Natural, to minor acclaim. Satomi Kurogane, a visual effects artist, entrepreneur, and frustrated songwriter, was so taken by 99% Natural that she contacted the band and offered to back them financially and artistically. They accepted, and were quickly won over by Satomi’s lyrical skills – she had studied English in the US a few years prior, and had a natural talent for poetry. Once Satomi joined, the band was renamed as Die Database. 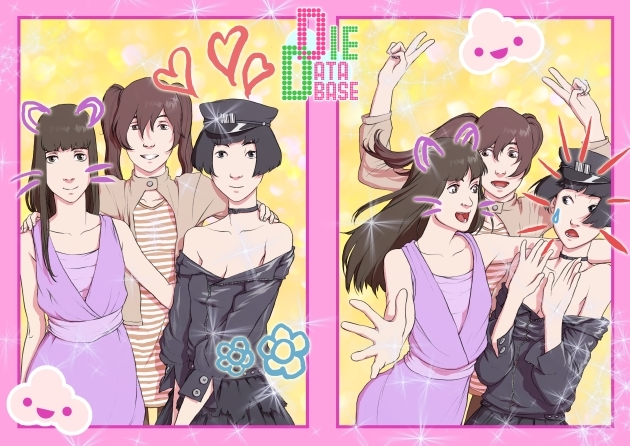 Die Database released two EPs independently, not just on CD, but for download as well, and they quickly gained fans worldwide. Their first big break was a song used in an Agartha Labs TV commercial staring Yuma. After that, they did a song for [Massive Cloud Burst], a RPG video game which was a cult hit in the West. The first Die Database album released was actually the second – they worked on their untitled debut for over a year, but never released it due to intra-band conflict. Masae and Yuma were happy with it, but Satomi wanted to push things further artistically. Eventually, they wrote a whole new suite of songs, and called that new album [Knee]. Their original debut has never been officially released. In early 2011, Die Database will tour Japan twice to support [Knee], and are trying to raise money to go to the US for a few shows. Their first tour will be notable since they are doing a series of shows that should get lots of attention – each show will be a full cover of a different Ringo Sheena album. Die Database are known for their energetic rock music and elaborate stage shows that transform small clubs into futuristic environments, with cutting edge holograms produced by one of Satomi’s visual effects companies, Agartha Labs. They are also known for their cosplay – they never perform in the same hand made costumes twice.